Film writers on tight deadlines for reviews, obituaries, or listicles often skim Wikipedia and other quickly digestible online sources so as to feign expertise, but there’s no need to do so with Jimmy’s Hall. Instead of looking at the relatively skimpy biographical Wiki for James Gralton, the subject of Ken Loach’s film, critics can in this case turn to its doorstop of a press kit. It includes a five-plus-page essay on Gralton’s legacy from Loach’s longtime screenwriter, Paul Laverty; an even lengthier and unabashedly polemical biographical timeline; and two primary source materials written by the man himself—a good start for discerning how the movie freely reshapes its subject’s life. The only Irish person to ever be deported from Ireland, Gralton (Barry Ward) was a dedicated socialist who agitated against landlord abuse, raised funds for the IRA, and most importantly to this film, helped the kids dance. Jimmy’s Hall starts in 1932, as Gralton returns from a decade in America. Before he left his hometown of Leitrim, Gralton helped build and run a sort of community center where Irish songs and literature were taught and regular dances held. The hall’s existence posed a de facto threat to the authority of the church and life got hectic during the Irish Civil War, hence Gralton’s self-imposed exile. Upon his return, he’s immediately approached by a group of young people who ask him to reopen the space so they can dance “somewhere where there won’t be a guard or a priest.” Jimmy accedes, the hall reopens, and trouble inevitably follows. 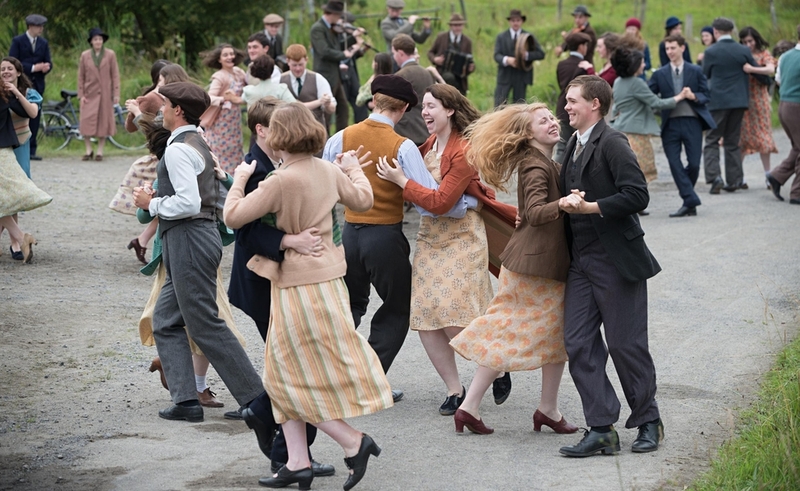 Something like film’s very own Billy Bragg, Loach is an unabashed socialist whose films haven’t shied away from the complexity of arcane factional debates within the left when considering the Spanish Civil War in Land And Freedom, or the Irish Civil War in The Wind That Shakes the Barley. Jimmy’s Hall gestures in this direction, but simplifies the rhetorical back-and-forth: The press kit is awash in party acronyms nowhere to be found in the film. As numerous reviews have unavoidably noted, Jimmy’s Hall is less a detailed political history than Footloose redux, pitting Jimmy against priest Father Sheridan (Jim Norton), who inveighs in the pulpit against “this craze for pleasure” and “jazz music” whose rhythms come from “darkest Africa.” The stakes here are considerably higher than Lithgow v. Bacon, however, with Sheridan’s concern about Marxism spreading its tentacles among the underclass and fomenting rebellion against Holy Mother Church backed by British-sanctioned violence covertly and overtly taken against Jimmy and his supporters. Laverty’s script is clear on identifying the interlinked enemy, then and now: “the masters and the pastors,” per one Gralton supporter. The outraged sincerity of Jimmy’s Hall is never in doubt, and the film encourages viewers to draw meaningful connections between the past and present, like the worldwide Great Depression, denounced as “man-made, not natural,” or the sorry spectacle of police officers ordering the righteous to “stop resisting” while holding nightsticks to their neck. Yet this is a very rote cinematic rendition of “The Internationale.” Loach lays on the sentimentality thick in the early stretches, with mournful trumpets from George Fenton’s score setting the maudlin tone, and there’s a stillborn romantic subplot that stubbornly refuses to enrich the main political text. For a good while, it seems as if the residents of Leitrim do nothing but dance in traditional fashion and laugh giddily, except for those times when they’re being excoriated by Father Sheridan: The high spirits come off as labored, and the binary high-low tonal shifts leave little room for nuance. (The actual group dancing sequences, with live location sound from the music, are convincing enough.) As the film progresses, its politics become more explicit than “let the kids dance,” and scenes of tactical argument—with performers sometimes stumbling over their words, as if in a fit of tongue-tied passion—do credit to Loach’s true-believer status. If this is, as he claims, indeed his last film (or at least last big narrative feature), he’s retiring with the courage of his convictions intact. If only he was expressing them more vigorously.